Once the adhesive mortar that hold the tile to the walls has dried, the tile installers come back to the house to grout all of the seams. 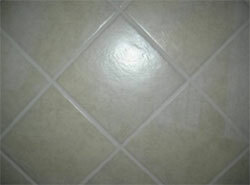 The seams are then sealed with a sealant and the surface of the tile is cleaned, leaving a nice, detailed Finnish. Adhesive is essential in joining two different materials together. It is important in industrial and housing construction. It bonds two materials together by initiating a chemical reaction that causes the two materials to connect such as a tile and the concrete of the structure. There are different types of adhesive mortars used in bonding which also depends on the location of the material as well as the situation. The level of the substrate will determine what type of mortar should be applied. Either it will be thin layered or medium layered. Universal mortar is the most common adhesive mortar used by contractors since it is mixed with water to bond to any surface. The mortar usually sets in 6 hours. It has the capacity to retain water and it allows adhesives to hydrate. The setting of the adhesive mortar depends on its thickness. There are mortars that need a setting for 24 hours especially for the sloping substrate. Thin layer mortars can be either water mixed or dry set mortar. The mortar is mixed with cement, water, sand and an additional element that will help achieve water retention. It will also help the adhesive mortar to hydrate which is vital for adhesion. Thin set mortar is applied directly to a substrate to bond. It is not advisable to apply a thin set mortar in a sloping surface or in a cold freezing place where snow is prevalent since there is a possibility of ice formation in the mortar that will cause the floor tile to loosen from the substrate. Acrylic mixed mortars have a strong ability to bond and absorb less water. It is ideal for wet or dry application and is suitable for use in pools and colder temperatures. Acrylic mortar is also used on floors that have an under floor heating system that helps the mortar retain elasticity and prevents the loosening of adhesive. Organic mastics are a type of adhesive that does not require the mixing of ingredients. Homeowners who repairs or attach their own tile flooring prefer this type of mortar adhesive in their do-it at home projects since the floor tiles have a limited possibility of slipping or loosening due to the uneven mixing of ingredients. On the downside, this adhesive can only be applied indoors. Medium set mortars is suitable for sloping areas since it can hold tiles better and can support heavy materials. It is suitable also to level a floor since the mortar applied is thicker as compared to a thin set mortars. Mortar is the most common used adhesive due to its flexibility and capacity to hold a material in place. However, polymers are applied to improve the adhesion of the mortar. It serves to protect mortars and tiles from loosening due to freezing temperatures and seeping water. Acrylic-mixed and latex mortar is used for material that needs a strong adhesive and can absorb water efficiently. This adhesive is recommended for wet settings however, it can also be used for dry settings. In mixing adhesives, follow the instructions carefully to finish with a desired result. When buying adhesives, check the adhesive based on where you will use it, whether it is indoor or outdoor, capacity to hold, drying time and its capacity to resist water. Your goal is to maximize the use of adhesive and to prevent accidents due to the loosening of floor and wall tiles. Check with your local hardware store for more information. They should be able to guide you in choosing the right type of mortar for your job.